I often use the phrase "golden age" when referring to the period in the mid-1980's, when Citadel produced their best miniatures. 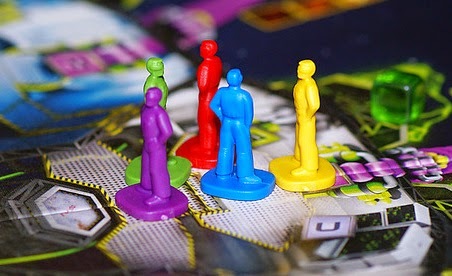 But we are living in another golden age right now -- the age of great board game design. Even the mainstream press has noticed this renaissance, with the Guardian recently observing, "Games are simply getting better. Publishers are turning out products with elegant mechanics and impressive artwork as fast as their customers can snap them up." I like to bask in both these golden ages at once, mainly by replacing the components in modern games with vintage miniatures. My latest project was enhancing Space Alert, a science fiction board game, by using Paranoia miniatures produced by Citadel and Mongoose Publishing. What is Space Alert? A solo/cooperative game in which the players control a space craft with a very simple mission: arrive by hyperspace in an uncharted solar system and stay there for 10 minutes, until the ship's computer maps the area and then automatically jumps the ship back home. 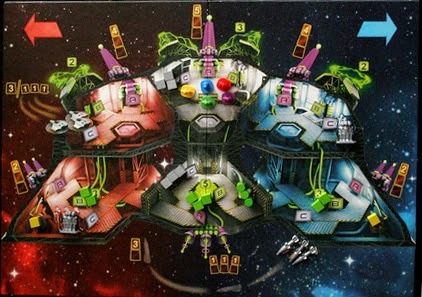 The players spend the game working together to respond to various threats, including aliens, asteroids and boarders. Their job is made complex by the fact that the ship itself is a piece of trash, with unstable warheads, faulty elevators and a slow computer. Why is Space Alert worthy of your notice? Well, it is designed by Vlaada Chvátil, who (in my view) is the most creative game designer Europe has to offer. No one is better at giving a game that precious quality which sometimes goes by the name flavour: the ability of a game's rules/mechanics to evoke the underlying setting behind the game. Space Alert has flavour because it has an innovative set of rules that perfectly echo the setting of panic and incompetence on a 3rd rate space ship. Your ship is specially designed to be crewed by morons. The 10 minutes that your ship spends in danger is played out in real time, with threats appearing in accordance with a CD recording (or a smartphone app) mimicking the ship computer's announcements. But more than this, the game simulates the frantic bumbling of the ill-trained crew by making everyone plan out what they think they are doing for those precious 10 minutes, without giving anyone a proper chance to ensure that they are actually cooperating. The end result is a short but intense gaming experience, where the players face the high cost of seemingly innocent miscues, like trying to pile two people into the same elevator, or forgetting to shake the central computer's mouse before the screen goes to sleep. The final judgment: a fast, hilarious game with lots of replay-ability, and a high tolerance for beer impairment. A final note about the miniatures. Space Alert requires miniatures for five crewman, each marked out with a different colour. When I was casting about for minis to use with this game, I quickly fell upon the Citadel Paranoia range. In general theme, both games are similar: science fiction parodies involving incompetence and failure. Even better, the Paranoia miniatures look like most players feel when playing Space Alert: terrified, paralyzed or full of hubris. But my search for the best miniatures led me to discover the excellent sculpts that Bobby Jackson made for Mongoose Publishing circa 2004 for "Paranoia XP". 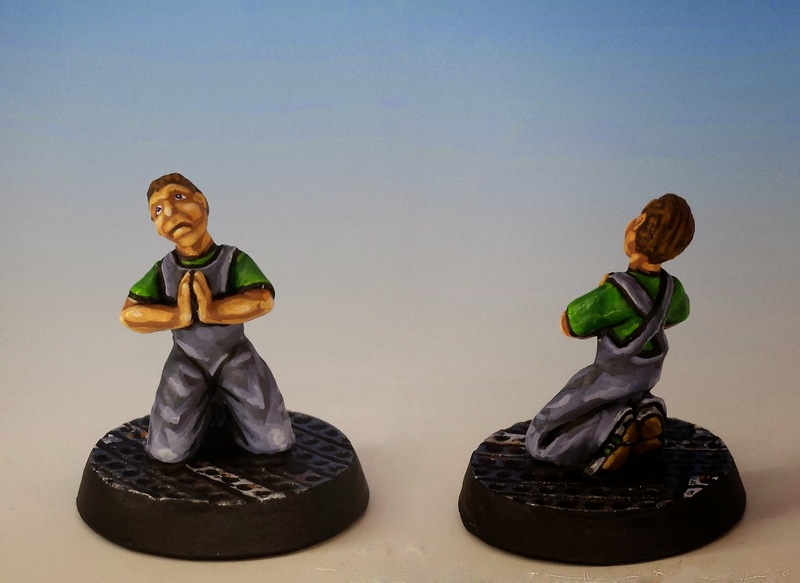 These sculpture are every bit as funny and dramatic as Citadel's original designs, and so I was happy to use Jackson's Praying Troubleshooter as one of my crew. (On eBay, you will often see these Mongoose figures confused with the Citadel range -- and indeed, they are completely compatible in scale and feel). I filled the role of Blue Captain and the Red Security Officer using Citadel's Paranoia Security Guards. The three remaining crewmen are Troubleshooters wearing overalls, two from Citadel and one from Mongoose. I gave the crew unity of uniform by using the same base colour of blue-grey for overalls and armour (Vallejo Colour's Sombre Grey) -- and then personalized everyone by painting their T-shirts and accents in different primary colours. The result: a much richer experience of this great game! Ha, Space Alert! A favourite game of mine. Sadly, not all players in my group seem to enjoy it. Especially the analyze-everything-to-death bunch has problems with it. BTW, I used Space Alert as inispiration for a one-off siege game I once ran. Defenders in the castle, and new attackers came popping up from various directions and times at random. Although the real-time component and the planning is difficult to integrate in a miniatures game, the random generation of encounters certainly is useful. Hmmm, thanks for the info on the game. I may give this one a second look and try it out at some point now. I'm sure your figs will add a lot to the feel of the game now. Speaking as a fellow Space Alerter, thank you for fixing one of its (very) few design oversights. 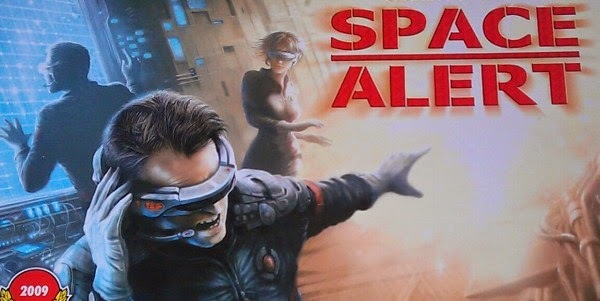 For a game about untrained redshirts flailing their way around a tinpot spaceship, the competent-looking officers on the box art are dead wrong. The original minis are at least somewhat better, since they lack any unique details (more grist for the mill!) and put each character in a bored, unsure pose. But your Paranoia figures are a vast improvement. If you aren't cackling, screaming in terror, or praying while playing this game you're doing it wrong! Sounds good, I may have to check it out and stick in a few subsitute minis too. Sounds like a ton of fun, outnumbered, sub average crew, high probability of death, what are we waiting for? Great painted figures! I like that one begging on his knees!